•Dual Reverb Effects: The power to combine two reverb engines truly expands the pedal's ambient possibilities. Run dual reverb effects in a parallel or cascading signal path, or split your reverbs and send a different effect to each of the pedal's two Outputs. •Massive Processing Power: Dual processing eliminates bloated all-in-one reverb programs. Instead of being forced to allocate 5% of the processing power to something vital and complex like the True Spring reverb, we can now dedicate 100% of the processor, opening the door to a new frontier of realism and sonic exploration. •True Spillover: Seamless “spillover” from one preset to the next is an enormous advantage in live situations. Switch from one reverb preset to another without abruptly cutting off the trail of the previous effect. And, the dual reverb engines make it possible to program (with the soon-to-be-published Neuro Desktop Editor) the decay rate of the first reverb trail. The True Spring engine is the perfect example of the Source Audio engineering team taking full advantage of the Ventris Dual Reverb’s immense processing might. True Spring flawlessly captures all the subtleties and idiosyncrasies of classic spring reverb equipped amplifiers, including the characteristic "drip" associated with the vintage effect. Spring reverb simulation was a major challenge, requiring a deep understanding of the physical characteristics of reverb springs, advanced experience in sound design, and exceptional processing power. Chief Scientist Bob Chidlaw drew upon all his knowledge and experience in the creation of the True Spring engine, from his days as head engineer at Kurzweil to the creation of Source Audio’s Soundblox 2 Dimension Reverb. •Over 20 Reverb Engines — Ventris features 12 onboard reverb engines accessible via the center selector wheel, plus an expanding collection of reverb engines available via the Neuro Desktop Editor and Mobile App. •128 Presets — Save up to eight presets accessible via the onboard controls or save up to 128 presets recallable with MIDI program change (PC) messages. 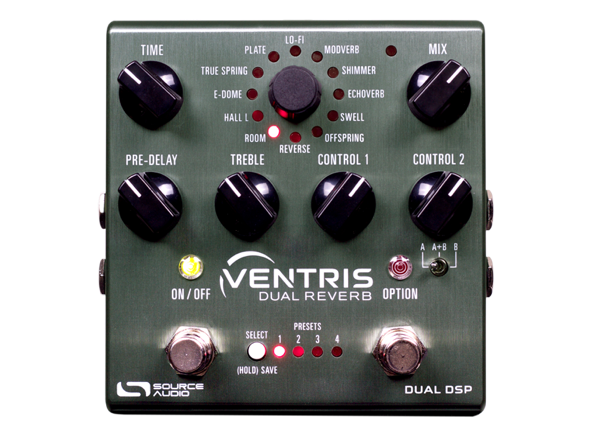 •Dual Reverb Processing — The Ventris Dual Reverb features two independent signal processors giving the pedal essential features like preset spillover and dual reverb effects. •True Spillover — Two individual signal processors make it possible to change from one preset to another without abruptly cutting off the reverb tail of the original preset (Note: Spillover is unavailable when creating simultaneous dual reverb effects (A+B on the toggle switch)). •Simultaneous Reverb Processing — Select the A + B toggle switch position and create dual reverb effects. Run two reverbs simultaneously in parallel, series, or left/right signal paths. •Selectable Footswitch — Choose from a variety of OPTION Footswitch assignments. Control options include preset scrolling, A to B or A plus B reverb toggling, reverb hold, runaway reverb, and tap tempo. •Hold (a.k.a. 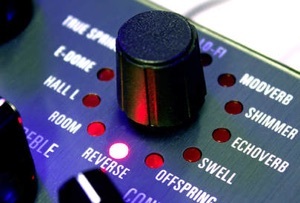 “Freeze”) Control — Use the OPTION switch to hold a small portion of the reverb tail in a continuous loop, essentially sustaining a note or chord until the footswitch is released. While the Hold function is engaged it is possible to play over the top of the loop with either a dry signal or the dry/wet signal from the second reverb processor. •Runaway Reverb — Similar to the Hold function, the Runaway Reverb uses the OPTION switch to loop a small portion of the reverb trail. But rather than maintaining a steady sustain, the loop is feed back into the reverb processor, creating a building self-oscillation effect. •A to B Reverb Toggling — Use the OPTION switch to toggle between any preset’s A and B reverb, or use it to toggle from a single reverb to reverb A + B. •Stereo Input and Output Jacks — Create dramatic stereo reverb effects or set up an external effects loop. •Analog Dry Through — For most of the reverb engines and signal routing options the dry signal remains an analog signal and does not pass through the signal processor at any stage while the pedal in engaged. •Deep Editing Functionality — Adjust additional parameters, save and share personal presets, and download bonus reverb engines with the Neuro Desktop Editor or Mobile App. (Check the Neuro tab for more details). 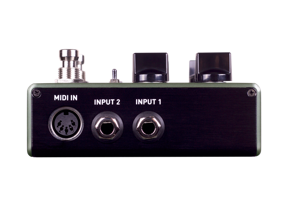 •Complete MIDI Functionally — Receives MIDI program change (PC) or continuous controller (CC) via the 5-pin MIDI DIN Input (also includes a MIDI Thru jack), the USB port, or in conjunction with the Neuro Hub. •Universal Bypass — Select either buffered or true bypass. •Trails Mode — Rather than abruptly cutting off the reverb trails upon bypassing the effect, Trails Mode allows the Ventris Reverb’s trails to decay naturally. •Expression Control — Program simultaneous expression control to multiple knobs with independent depth and direction assignments for each. 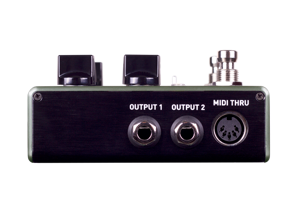 Compatible with all Source Audio expression pedals, the Hot Hand 3 Universal Wireless Effects Controller, and 3rd party 1/4” TRS (tip hot) expression pedals. •External Switching Capabilities — Choose from a variety of external control options with an external 1/4” TRS (tip hot) footswitch. Control options include preset scrolling, hold, runaway, tap tempo, and processor toggling. •Free Effects Downloads — Access a growing library of additional effect engines. Edit those engines and burn them to any position on the effect selector or any of the pedal’s 128 presets. •Customize Effects — Make deep editing changes with the Neuro Editor’s huge collection of additional parameters. •Save and Share Customized Presets — Fine tune your reverb effect, then save it to your personal effects library and easily share it with the growing community of Neuro users. •Download Presets — Explore Source Audio’s ever-expanding, library of free effect presets. •Simple Connection — The Neuro Mobile App. 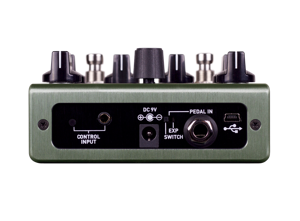 connects with the Ventris Dual Reverb via the mobile device’s headphone jack and stereo Input 2 on the pedal. A Neuro App connector cable (1/8” to 1/4”) is included with the pedal. The Neuro Desktop Editor connects to your computer via the mini USB port on the top of the pedal. •Join the Neuro Community — Visit the Web tab on the Neuro Mobile App or the Neuro Collective page on the Source Audio website and download from the ever expanding library of Ventris Reverb presets created by other Neuro Community members. Using the MIDI IN jack (5-pin DIN) or a USB connection, the Ventris can be controlled by generic MIDI Continuous Controller (CC) and Program Change (PC) messages. Many of the Ventris’s parameters (even those that are not assigned to a control knob) are directly accessible via MIDI continuous controller messages. •Preset Saving / Program Change (PC) Messages — Save up to 128 effect presets recallable with MIDI PC messages. •5-Pin MIDI DIN Ports — Send MIDI program change (PC), continuous controller (CC), and clock messages to the Ventris via its MIDI IN jack. Pass MIDI messages on to other pedals with the MIDI THRU jack. •USB Port — Send MIDI program change, continuous controller, and clock messages to Ventris via its USB port. •Neuro Hub — Connect the Ventris to the Neuro Hub and send receive MIDI messages via the pedal’s 1/8” Control Input. •Includes 1/8” to 1/4” cable for Neuro Mobile App connection.